Only a couple of pictures of such fungi so far, I'm afraid. But I hope to have more soon. A beautiful mushroom, with it's meaty white flesh, pale yellow cap, volva, and white gills. And in itself fairly harmless (if unappealing to eat, because of the smell). I'd advise no one to ever eat it. It's not poisonous in itself, but it's awfully similar to the deadly poisonous Amanitas. Avoid eating it. 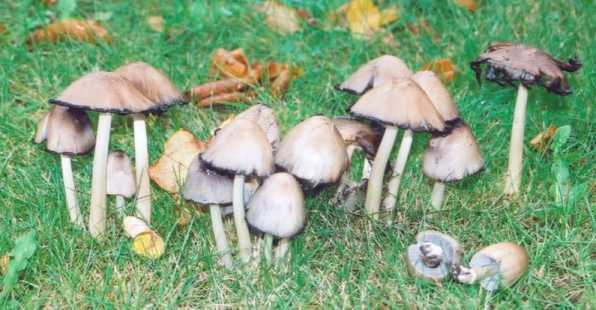 The common ink cap (or inky-cap if you're American) straddles the poisonous/edible boundary. If you can guarantee not having a drop of alcohol for a day before and after you're eating it, then it's edible. If you mix it with the slightest bit of alcohol then you'll be horribly, horribly sick. Even a small amount of alcohol in a prescription drug can cause trouble. 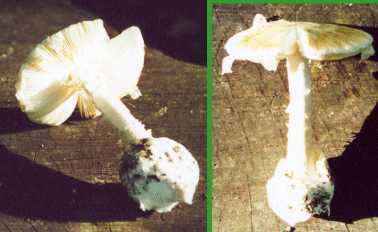 The drug disulfiram ('Anrabuse'), is based on the ingredient of this fungus that is responsible. Like the shaggy ink cap on the edible mushrooms page, this one dissolves rapidly to become a black, inky goo, and in so doing releases millions of spores. 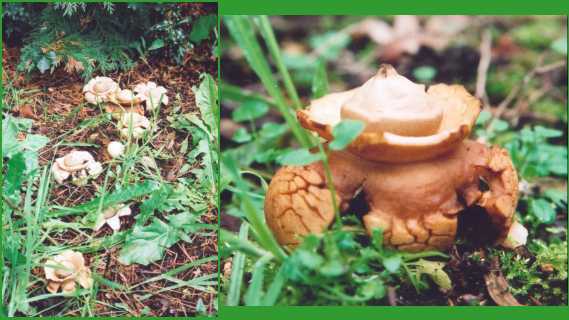 It's fairly common, found around dead trees, or above buried wood. This is one of the more common earth stars. Alledgedly they're eaten in some parts of eastern europe before they open up, but it would be a shame to pick this before it opens out. It starts off a bit like a pointy egg, which then opens up to reveal a ball with a pore in the middle. When a raindrop lands on the ball, it shoots out a little cloud of spores. The flaps that have opened out bend right back and lift the ball off the ground. I've found them under conifers and rhododendrond. 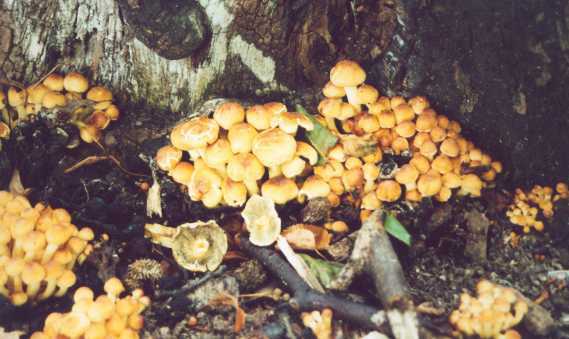 The sulphur tuft. A very common inhabitant of dead tree stumps. It's a beautiful fungus, yellow and green and growing in huge bunches. It's almost a good thing that it's not edible, it would be a shame to pick such a thing. Toxic to about 50% of the population, but why the other 50% would want to eat a fungus that reeks of phenol is beyond me. 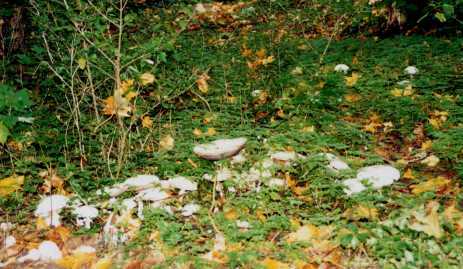 Looks like it ought to be great to eat, rather like any other big Agaricus. When you cut or bruise the edge of the cap or the stipe, it stains bright yellow (hence the common name, 'yellow stainer'). Add that to the smell (and the huge, pendulous ring), and it's easily distinguishable from other Agaricus. 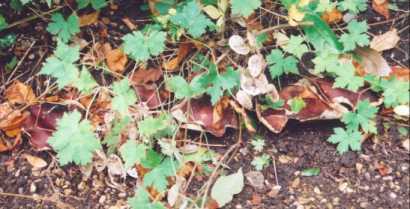 It's the single most common mushroom I find here in Cambridge, England. I don't know whether this hard, tough, leathery polypore is poisonous, but there's no way you could eat it. You find it on dead wood, where it sits there being much too resilient for all but the most determined of insects to burrow into.